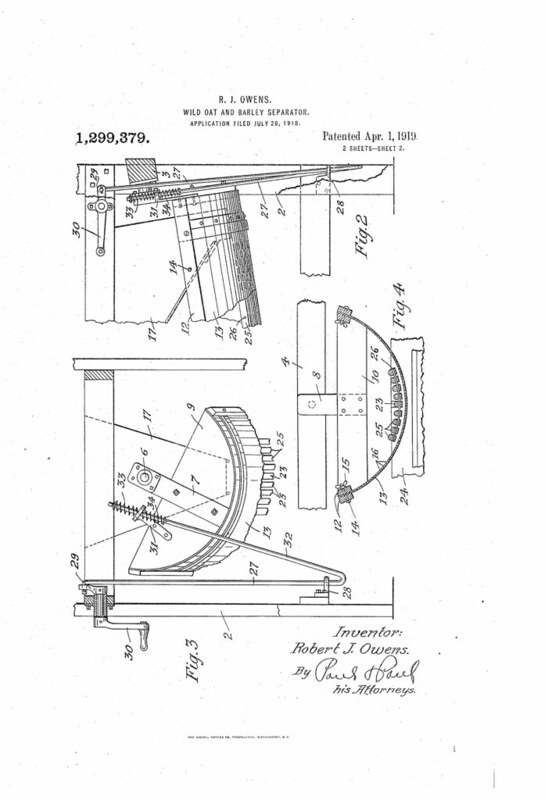 My invention relates to certain improvements in the apparatus for and method of manufacturing beer set forth in Letters Patent No. 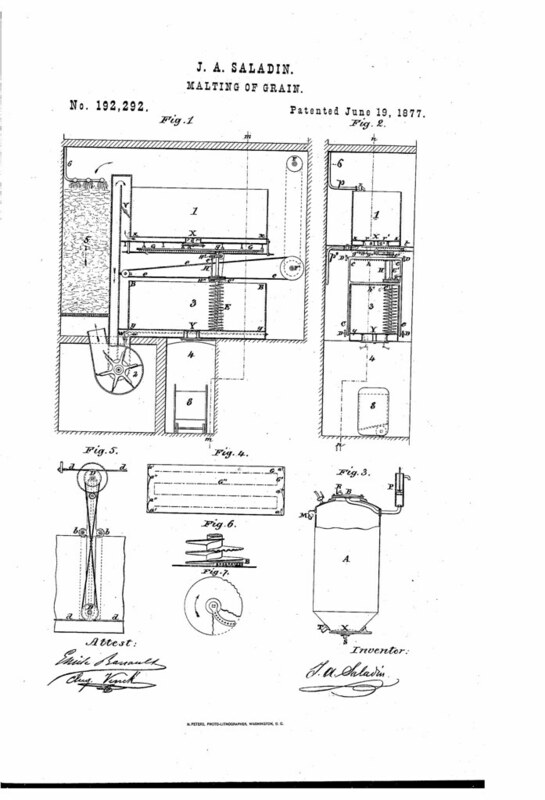 324,523, granted to me August 18, 1885; and my invention consists in combining and heating the materials forming what I term the supplemental mash, which consists of raw grain and malt mixed in proper proportions and under conditions as set forth in said patent, as fully set forth hereinafter, so as to adapt the operation to the character of the material acted upon and reduce the length of time required in making the supplemental mash, and also in certain improvements in the apparatus. In this class of apparatus, as ordinarily constructed, the stirrer blades are immovably fixed in position, or are so arranged and fitted for the one kind of mash to be made that they cannot be used for anything else than for an ordinary mash, nor can they be changed in any manner, and they fail to so agitate the mass as to maintain all parts at the same temperature and in the same condition. In the apparatus as constructed by me the blades are easily and readily changed as to number, position on the arms, their angle to the arms and each other without any danger of their working loose while in motion, thus enabling me to make either a very thick or thin mash and successfully operate with any kind of grain (malted or unmalted) or starch, maintain all parts in the same condition, obtain the largest possible percentage of extract, and to use a very much larger percentage of the raw grain. The object of my invention is the malting of grain, barley for breweries, or any other grains, and consists in causing grain to germinate in very thick layers (one meter or more) and in ventilating and stirring it mechanically, so as to obtain a great saving in manual labor over the old process, although producing with great regularity, and throughout the whole year, a malt of superior quality. The apparatus and means used are as follows: First, a soaking-tub; second, a germinating-box; third, damp and cool ventilation fourth, a stirring apparatus fifth, a mode of carrying or transferring the grain from one apparatus to the other. 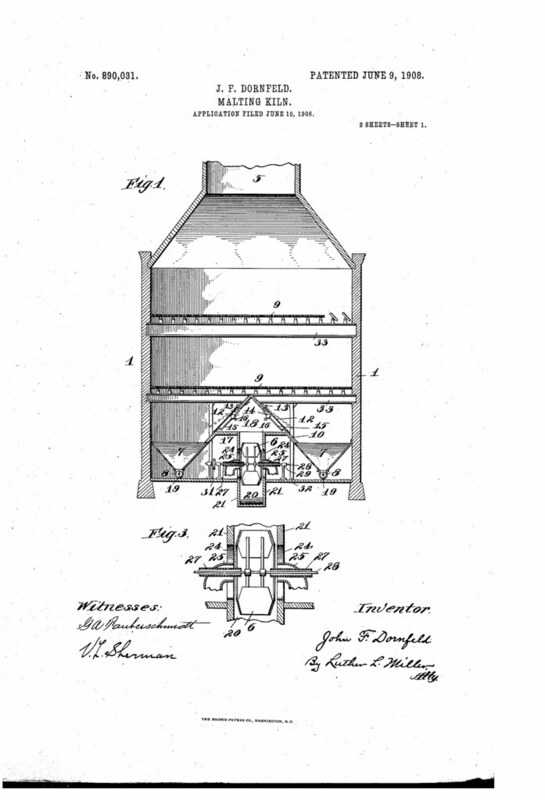 This invention relates to an improvement in the manufacture of beer and ale from barley malt and the starch extracted from Indian corn or maize. 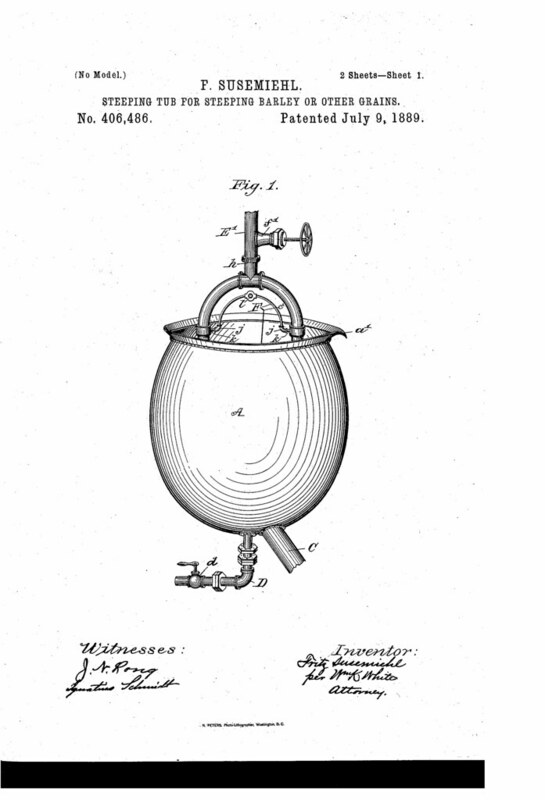 The object of this invention is to utilize the starch contained in the Indian corn for producing a heavy, light-colored wort, without imparting to the malt-liquor an objectionable taste or flavor or impairing its keeping qualities, by extracting from the corn in a simple and inexpensive manner a crude starch which is substantially free from impurities, and then producing a wort from this starch in connection with barley-malt. I have invented certain new and useful Improvements in Malting-Kilns, of which the following is a specification. Malting kilns as heretofore constructed comprise buildings of considerable height, in the upper part of which are arranged the malting floor or floors, and in the lower part are introduced the hot gases and. products of combustion from a furnace, together with a quantity of fresh air. No means is provided for mixing the hot and the cold air to produce a uniform temperature throughout the kiln and asa consequence the hot air rises in columns through the cooler surrounding air reaching the top of the kiln and there escaping through the ventilator at a temperature considerably in 4excess of the cool fresh air remaining in the bottom of the kiln. One of the objects of this invention is to obviate the difficulty mentioned by mixing by mechanical means, the hot air and gases with cool fresh air, making a uniform mixture and introducing said mixture into the Further objects of the invention are to reduce the height of the kiln building, which reduction is rendered possible by locating the furnace outside of the kiln proper, and in other ways to improve the construction of such kiln. The present invention relates to controlling germination of barley in the malting process. More particularly, the invention relates to the treatment of malting barley by ionizing radiation prior to the malting process. There was exciting news yesterday about a find in China by a research team from Stanford University. 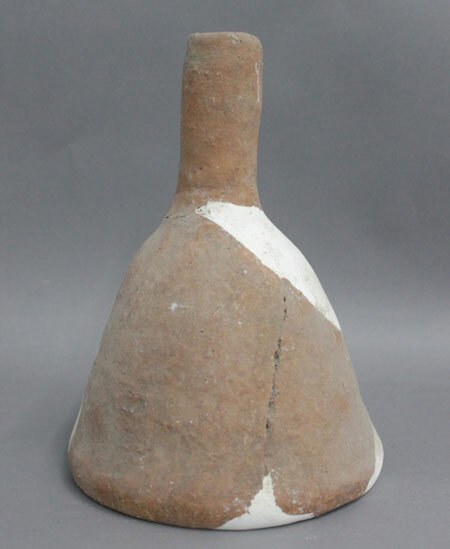 According to one source, “Archaeologists have discovered what they believe to be the earliest direct evidence of beer brewing in China, a trove of beer-making equipment dating from between 3400 and 2900 BCE, discovered at the Mijiaya site in Shaanxi province. 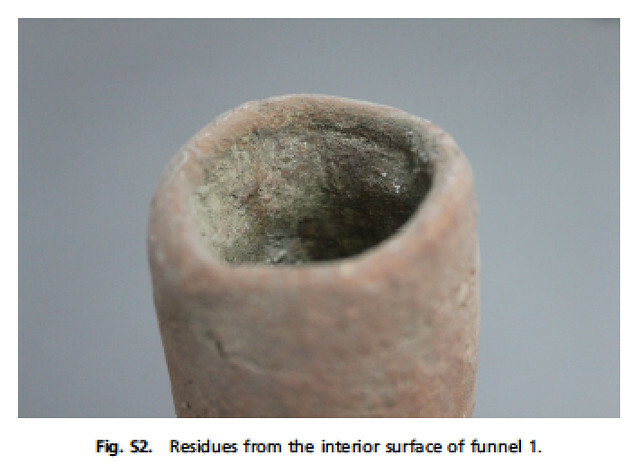 Along with this archaeological find, scientists conducted an analysis of residue on the ancient pottery, jars, and funnels found, revealing a surprising recipe for the beer.” Their findings will be published in the PNAS (Proceedings of the National Academy of Sciences of the United States of America). 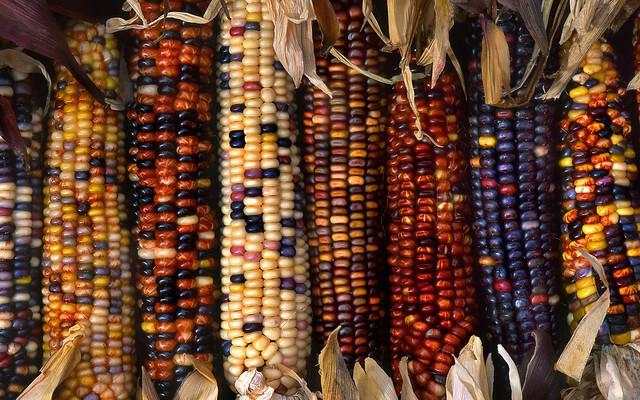 This research reveals a 5,000-y-old beer recipe in which broomcorn millet, barley, Job’s tears, and tubers were fermented together. 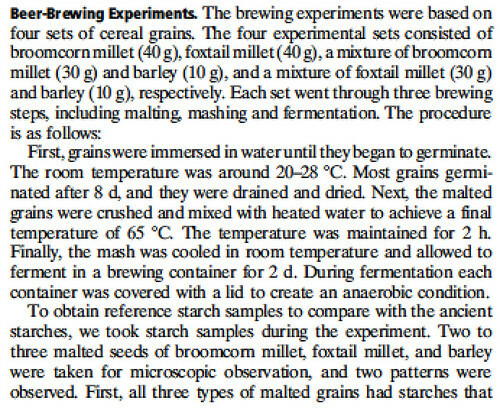 To our knowledge, our data provide the earliest direct evidence of in situ beer production in China, showing that an advanced beer-brewing technique was established around 5,000 y ago. For the first time, to our knowledge, we are able to identify the presence of barley in archaeological materials from China by applying a recently developed method based on phytolith morphometrics, predating macrobotanical remains of barley by 1,000 y. Our method successfully distinguishes the phytoliths of barley from those of its relative species in China. I’m not sure how that squares with Chateau Jiahu, the beer made by Dogfish Head based on a 9,000-year-old find in China, from Northern China. 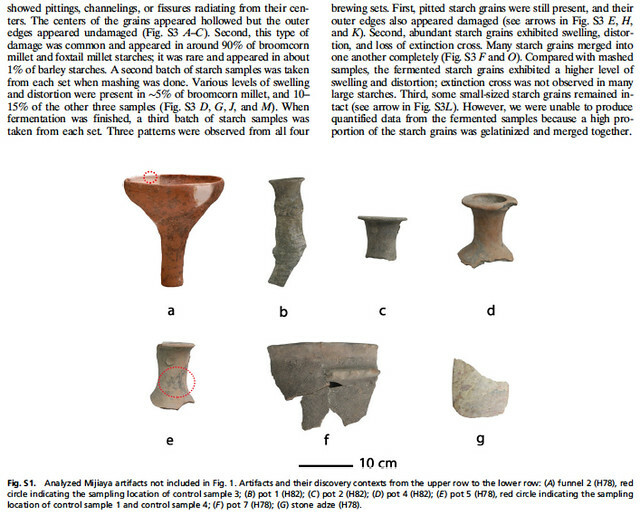 They also found preserved pottery jars “in the Neolithic village of Jiahu, in Henan province.” The difference, as far as I can tell is the ingredients themselves, although in both they do use barley. This beer recipe calls for broomcorn millet (Panicum miliaceum), barley (Hordeum vulgare), Job’s tears (Coix lacryma-jobi), and tubers to be fermented, whereas the earlier one from Jiahu used “pre-gelatinized rice flakes, Wildflower honey, Muscat grapes, barley malt, hawthorn fruit, and Chrysanthemum flowers.” So their claim that this is older seems suspect unless there’s some qualifier I’m missing. As is typical, academic papers are only available online if you’re already an academic or are willing to pay to look at it for a short period of time, so I’ve not been able to look at their full claims or at the recipe itself, except what’s been written about it by more mainstream news outlets. Step aside with your claims to long legacies, craft breweries! This reconstructed beer recipe is over 5,000 years old. It’s the earliest beer recipe—and the earliest known use of barley—in China. Archaeologists at Stanford University, while digging along China’s Wei River, made an intriguing discovery: A marvelously complete set of brewing equipment. And at the bottom of that equipment was something even more wonderful: Residue from the drink it once brewed. After scrapping that gunk from the pots, researchers analyzed it and confirmed that it was, indeed, leftover froth from a 5,000-year-old beer. They were also able to pin down the recipe of that beer to an unlikely, but delicious-sounding, combination of broomcorn millet, barley, Job’s tears, and tubers. So they claim, or rather Stanford claims, this is “the earliest known use of barley in China.” I didn’t think that the Chateau Jiahu added the barley to the original recipe, which was developed with the Patrick McGovern from the University of Pennsylvania, and I have a call into Dogfish Head to find out. But failing that, there’s a 4,000-year difference in the two claims that it seems hard for me to believe the Sanford team wouldn’t have uncovered. The report from CBS News calls the barley a “secret ingredient,” which seems really odd, but seems to reflect the surprise of the researchers on this project. But McGovern’s find in the Jiahu area of China is more than ten years old, and got considerable media attention when the modern version of the beer was first released in 2007, so again I’m not sure a) how they could have missed it or b) what makes this find different, and if it is why none of the news reports are addressing that difference. Some news outlets, such as IFL Science, do mention that beer is older than 5,000 years, which is fairly well-known. Whether it was known in China at the very beginning, as it was in the fertile crescent seems to be gaining ground as a theory. According to the present invention there is provided a novel malting process which gives greatly increased malt recoveries and with other benefits which will be disclosed hereinafter. There is also provided a novel malt produced having substantially retarded, and/or essentially free of rootlets. 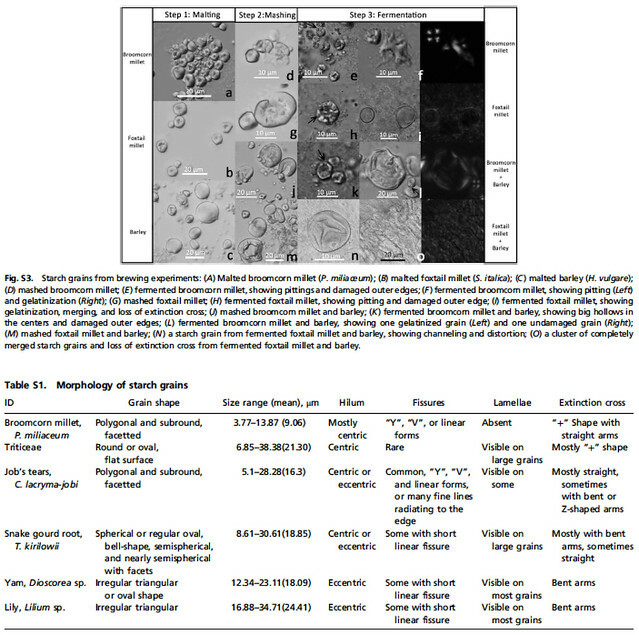 This novel malting process broadly comprises acidulating a cereal grain, as well as contacting the cereal grain with a growth-stimulating amount of gibberellic acid, in the period from initial steeping to the growth or germination stage prior to any significant growth or germination, viz, usually within about 6 hours, and as much as 1 day, or slightly longer, after steep out, and thereafter completing the germination. By acidulating is meant applying an acidic substance to the grain, such as by spraying or immersing the grain in an aqueous solution of the acidic substance to inhibit growth. Thus, the acidic substance can be incorporated in the steep water at any stage of the steeping operation or it can be applied to the grain at steep out or thereafter and before any significant growth or germination has resulted, viz, within about 6 hours and as much as 1 day or slightly longer after steep out. 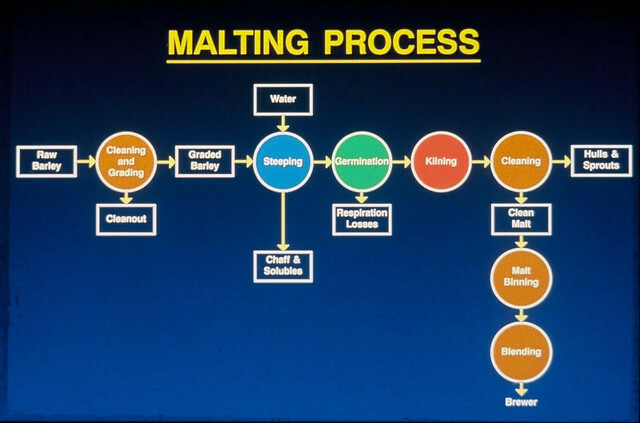 However, malt recoveries are generally progressively lowered as the acidulation treatment is delayed after steep out. Nevertheless, the malt recoveries generally obtained after such tardy or deferred acidulation are higher than without such treatment. Acidulation without the addition of gibberellic acid to the grain inhibits growth but the grain is not converted to usable malt, especially at low pH values below 3.8. Gibberellic acid alone without acidulation promotes growth but losses due to respiration and rootlets are excessive. Surprisingly, the combination of acidulation and gib- 4 untreated malt and, in fact, almost reaches the ultimate object of going from grain to malt without loss. The 1% loss in the aciduiated-gibberellic acid treated malt due to steeping and abrasion is presently considered unavoidable but negligible compared to the reduction in other losses. The avoidance of wasteful rootlet formation in the process of this invention is particularly significant since the germinating grain (barley) is more readily stirred and because matting is avoided. The barley thus requires less volume during germination so that more barley can be malted with existing equipment than when rootlet growth takes place. For example, instead of germinating 250i) bushels in a bed, from 3500 to 4000 bushels can be germinated. The increased productive capacity leads to lower costs. Furthermore, the essentially rootlet-free malt produced according to this invention requires much less storage volume and transportation space than conventional malt with rootlets. 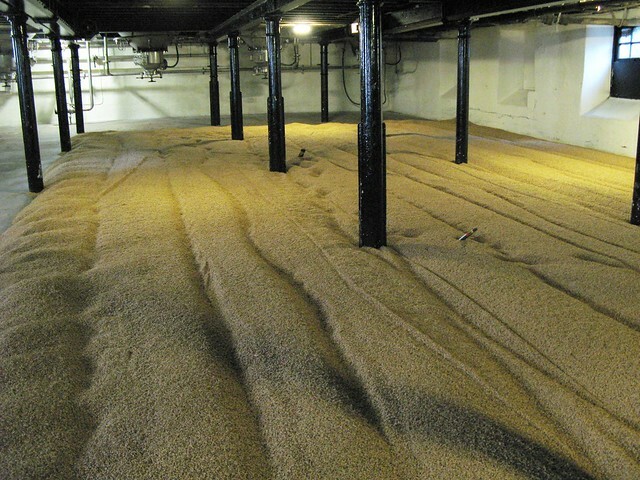 In addition, this malt has a higher bushel weight than conventional malt after the rootlets are removed. The reduction in loss due to respiration is also highly important, not only because of the waste of the kernel constituents which is avoided, but also because of the reduced amount of heat developed in respiration. This heat must be removed to maintain the grain at a proper malting temperature. Since less heat is evolved there is less to remove. Turning of the malt to avoid overheating thus can be reduced. There is also less expense involved in refrigeration since less cool air is needed to maintain the malting temperature. 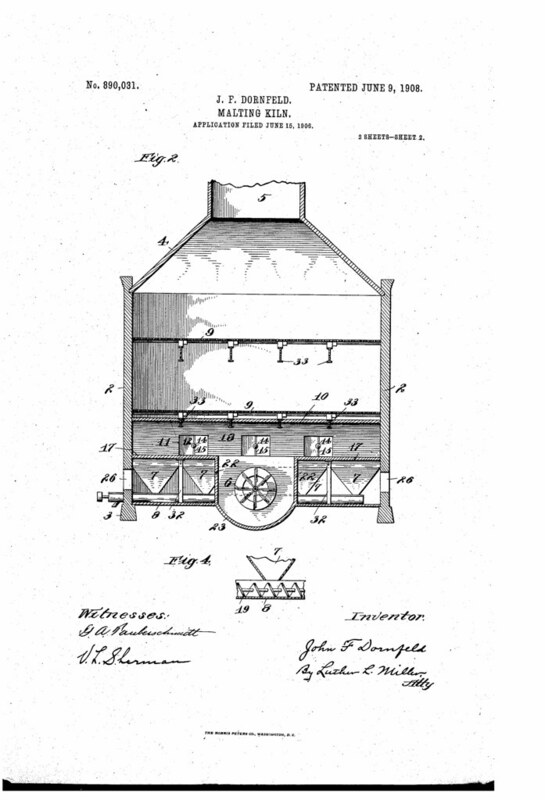 The object of my invention is to provide a separator which will dispense entirely with fans and air currents and wire sieves and of such devices as flannels, carpets and the like, frequently found in machines of this type for separating and grading grains. A further object is to provide a machine by means of which not only wild oats but small, imperfect kernels of grain can be separated from the full, plump kernels that are suitable for seed. When all forms of colouring were made illegal in 1816, Porter brewers had a big problem. How could they brew a beer of the right colour when using mostly pale malt? The answer was provided by Daniel Wheeler, who, by roasting malt in a way similar to coffee beans, created a malt capable of colouring a large quantity of wort. Pale malt was roasted at 360 to 400º F in metal cylinders, which revolved over a furnace. 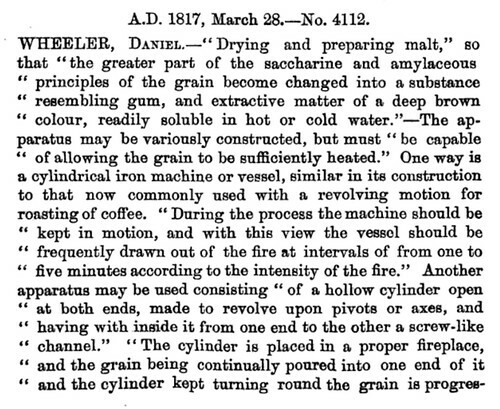 (Source: “The Theory and Practice of Brewing” by W.L. Tizard, London, 1846, page 90.) 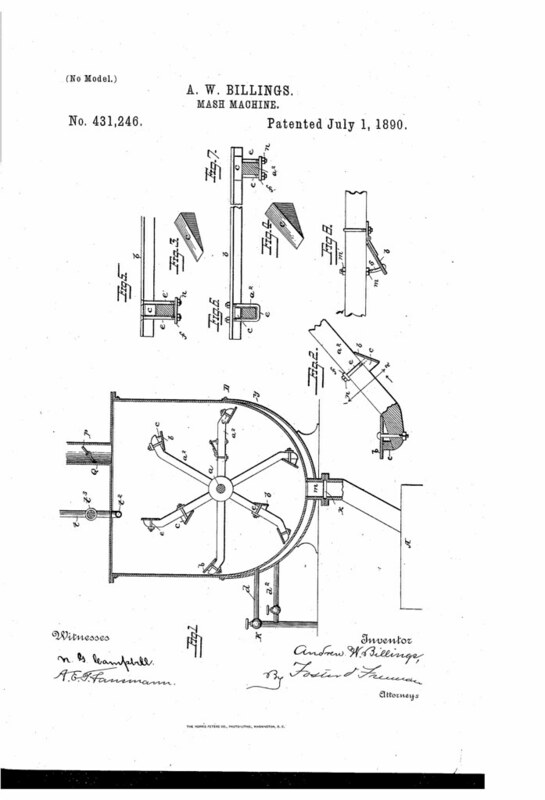 Wheeler acquired a patent for the process, hence the name patent malt. 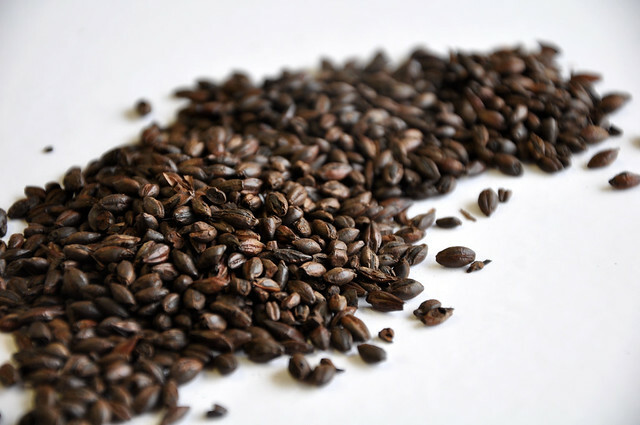 It was also known as black malt, porter malt or roast malt. 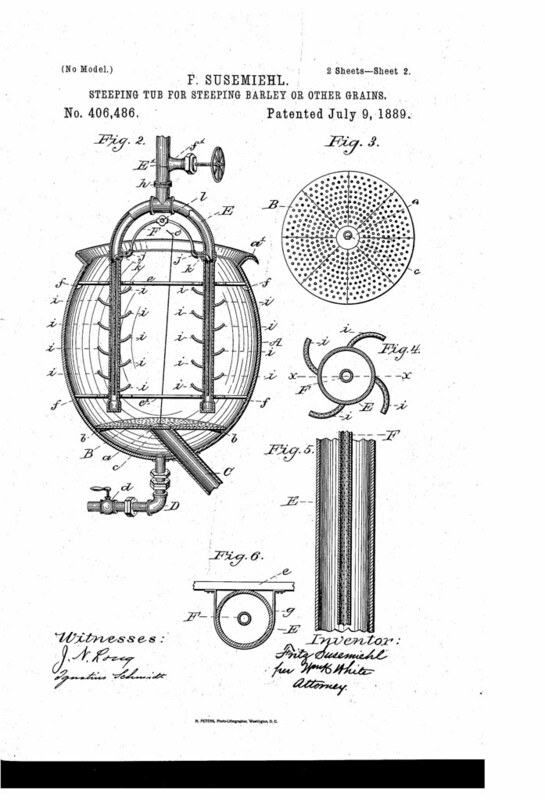 And here’s another account of his patent, and its effect on the history of brewing. 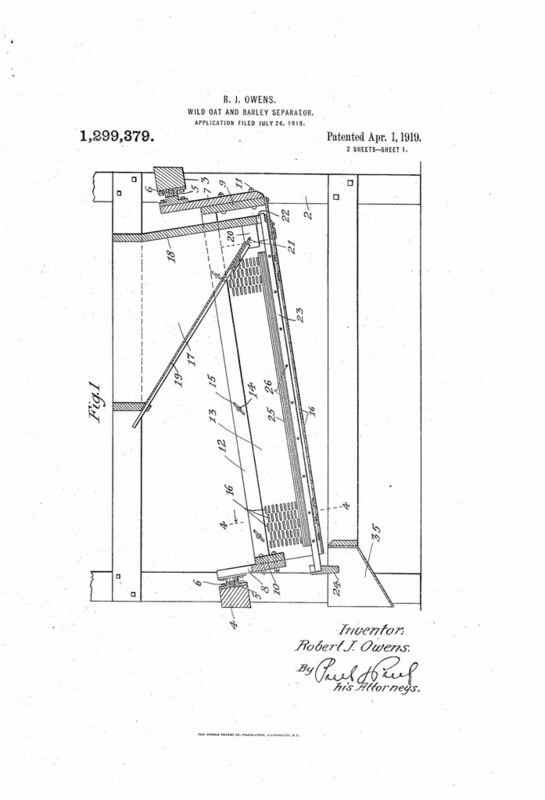 In 1817, Daniel Wheeler obtained British Patent No. 4112 for a “New or Improved Method of Drying and Preparation of Malt.” His invention of the Drum Malt Roaster allowed maltsters to roast malt to the point where a small amount of malt could darken a large amount of beer without imparting an overly burnt or tarry taste to the entire brew. Before Wheeler’s invention, brown ales were made exclusively from brown malt, but the advances in kilning technology gave way to the use of pale malts, which became a cheaper and more reliable alternative. Therefore, the color and flavor profiles of brown ales were subsequently determined more by modern style dark malts, crystal malts and caramelized sugars.